Making sure daily operations run smoothly is a challenge that all airlines face. Real-world conditions like absent crew members and gate changes cause operational challenges that need to be handled quickly and accurately. Manual processes to find crew that can fill gaps in schedules and rosters are very costly, time consuming, and inconvenient for crew members. Automating these processes and simplifying communication with crew members saves time and money, and makes it easier for crew to respond to a call-out when extra manpower is needed. 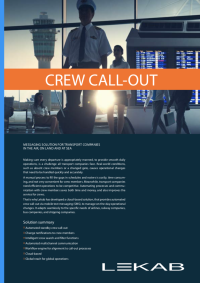 That's why we developed a cloud-based solution that provides automated crew call-out via text messaging or app, to help airlines manage operational challenges and quickly keep up with any change in plans. The solution adapts seamlessly to the needs of airlines and other transport companies.